Complete system for depositing an enriched monolayer of cells onto microscope slides. "Delivering superb cell recovery with trouble-free operation." The new Series 2 models fulfills Today's needs for Laboratories, with an easy and intuitive 21st century interface. Cytopro sets the standard for consistent performance and convenience in a cytocentrifuge. With the help of experienced laboratorians, we have designed and built a cytocentrifuge that puts unsurpassed ease of use, and maximum flexibility and safety at your command. The Cytopro cytocentrifuge is a complete, integrated system for depositing cells onto microscope slides including an advanced instrument console with touchscreen controls and an eight-station cytocentrifuge rotor. Our sample chambers are the heart of the Cytopro system. Their unique, well thought out design brings superb cell recovery and adherence without intricate error- prone procedures. In other words, it works like a dream! 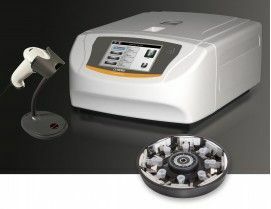 The Cytopro cytocentrifuge accepts our versatile range of sample chambers: single or dual for smaller/regular sized samples and the Cytopro Magnum™ large volume chambers for processing samples up to 6 mL. The Cytopro cytocentrifuge Series 2 is a complete system for depositing cells onto microscope slides. 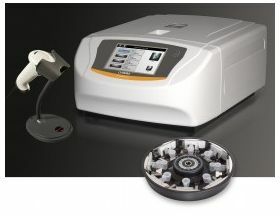 The Cytopro has touchscreen controls, and an eight place rotor that accepts single, double or large volume chambers. Cutting-edge microprocessor control and user programmability provides programming versatility. In addition to manual programming, you can store up to twelve frequently used combinations of rotation speed (100-2000 rpm), run time (1-99 minutes), and rotor acceleration (Low, Medium or High). Programs are easy to retrieve or clear. The user friendly display visually confirms inputs, current settings, or operation cycle status. The Cytopro rotor uses centrifugal force and three proprietary chamber designs to sediment cells onto slides with maximum safety and user convenience. The shallow profile makes sample ID easy and loading and unloading samples is convenient in a biological safety hood. Simply pipette sample fluid directly into the sample well. Slides and samples load securely into the rotor without fumbling. After the run, the chamber release lever cleanly separates the chamber from the slide. Both the slide and the sample chamber can then be easily removed. Cytopro's unique ergonomic design leaves no chance of smearing your cells. With the standard volume (single or dual) chambers, suspension fluid is simultaneously absorbed into the Cytopad ® absorption pad as cells contact the microscope slide. With the Cytopro Magnum large capacity chamber, the suspension fluid is removed by an absorbent foam pad by the end of the run. Standard volume chambers can be discarded with the used Cytopad, or can be autoclaved and reused with a fresh Cytopad. The Cytopro sample chambers are the heart of the Cytopro system. They combine ease of use with superb cell recovery. Innovative standard volume chamber designs make loading and pad alignment simple and foolproof. The semi-transparent sample chamber allows visual confirmation of correct sample volume. Proprietary flow control delivers consistent results. Dual addition ports allow pre-wetting—for excellent cell recovery. Because damaged spring clips can affect recovery, we use reliable coil springs instead. Chambers are available in single, dual and Magnum volume configurations to suit every need. Would you like to secure your settings with an administrator password? Do you want to be reminded to run a QC specimen? Just program the Cytopro as you like and the system will remind you. Need to reinforce your QC management and ensure compliance with new lab requirements? The Cytopro series 2 memory stores critical information including specimen ID, user ID, and cycle operation history–all exportable via a USB port. The new barcode scanner streamlines data entry, while manual keyboard entry is still an option. Enjoy a friendly user interface with many innovative features at your disposal, such as large touch screen, language selection, help screens, nameable and recordable programs, and easy updates with the USB serial port.